Savvas Chrysoulidis is a PhD Candidate in “Geoinformatics and Spatial Analysis for Security, Civil Protection and Crisis Management” at the Department of Civil Engineering and Geomatics of Cyprus University of Technology under the supervision of Prof. Phaedon Kyriakidis. He holds a BSc in Military Science from the Hellenic Army Officer Academy (2004), a second BSc in Geology, from the Department of Physical and Environmental Geography, School of Geology, Faculty of Sciences, Aristotle University of Thessaloniki (2011); he also holds a MSc degree in Geography and Environment (Postgraduate Programme: Geology and Geoenvironment), from the same Department. He is currently also a MSc Candidate in the OSCE BMSC One Year Postgraduate Diploma in Border Security & Management for Senior Leadership (BSMSL), accredited by EKKA (Estonian) Quality Assessment Council for Higher Education, Dushanbe. 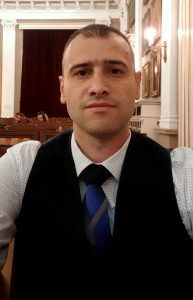 Savvas’s main research interests include Geoinformatics, Remote Sensing and Spatial Analysis, as well as Geographic Information Systems (GIS) and their applications relevant to Human Security, Civil Protection and Crisis Management. He is an Officer of the Hellenic Army at the rank of Major and he is an Instructor at the Hellenic Multinational Peace Support Operations Training Center (MPSOTC) since 2017.